Printed at Downpatrick in 1803 by James Parks. The following are the names of the Hectors of this parish of Lisburn since the reign of King Charles the first, the Revd. James Mace, Silvanus Haslam, Dean John Wilkins, Anthony Rogers, Richard Dobbs, Thomas Higginson, William Trail, and Doctor Snowdon Cupples, the present Rector. There are few houses of note in this parish; the late Mr. Closes of Plantation, a short mile from the town, occupied by Mr. John Barbour, who carries on the Cotton manufactory, &c. near this is a Seceding Meeting-house Messrs. Thomas Mussons and William Frazers of Largymore, Mr. Edward and Thomas Carletons of Blairis, Hugh Moors Esq. of Eglentine, Counsellor Pollocks and Mr. Kinkeads Carnbane, Captain William Pattens Rosevale, Mr, Thomas Garretts, late Dr. Tates, now Mr. Richardsons, where is a Bleach-green, late David Wilsons Esq. near the mill, a rural seat behind which are large fir groves, &c.
ground is situated in this parish, I suppose there is not a more eligible place for a camp in this Kingdom, bounded on one side by the river Lagan, (which divides the Counties of Antrim and Down,) and on the other by the new canal. 'Tis a fine level of about three hundred acres, and composed of a body of red sand for many feet deep, which absorbs the most heavy rain in a short time. The prospect from Ballymullen-hill in this parish is most delightful, having a full view of Belfast, Carrickfergus, Castle-Dobbs, the Sea, Mr. Stewarts, Willmount, Windsor, Mr. Johnstons Seymourhill, Mr. Durham's Belvidere, Lambeg-house, Mr. Bells, Mr. Henry Waring's Collin, Wm. M'Cance's Esq. Moira-castle, Hillsborough, Revd. Mr. Johnston's Ballymacash, &c. the valley from Moira to Belfast and Carrickfergus [-- ? --] miles in length, and from four to six in breadth, and for the same extent, there is not perhaps so beautiful a spot both from nature and art, in the three Kingdoms. From Lisburn to Belfast and along the along he shore from thence to Carrickfergus, is nearly like a town, the houses are so elegant and numerous, and the smallest cottage white. I have travelled from Dublin to Cellbrige, which has been reckoned the handsomest part of Ireland. There are many elegant Mansions -- Lord Carhampton's, (now Luke White's Esq.) Mr. Vesey's, Duke of Leinster's, Mr. Connolly's, &c. but upon the whole that part of the Country is not equal to this. From this hill of Ballymullan, (my own estate) one can see the spires of eleven parish Churches, viz. Warringstown, Maralin, Moira, Hillsborough, Magharagall, Lisburn, Derriaghy, Lambeg, Drumbeg, Drumbo, Newtownbreda, and Belfast. Here is also a full view of the beautiful range of Mountains, called Devish, Collin, the white Mountain, Castle-robin, Plover-plain, &c. which are in general a body of white limestone, the surface smooth and always green. The whole is so beautifully sublime, that I may say, a flood of Glory bursts upon our view; and intoxicates the soul with rapture. But soon will these transitory scenes, the baseless fabrick of a vision or cloud pass away, if we do not honor God, and his righteosus laws obey: if we do, shall enjoy more sublime raptures for ever. I shall mention an instance here of the honor and goodness and generosity of the late Lord Hertford. Prior to the year 1771, several tenants had built houses in different parts of the town of Lisburn, without having any promise from his Lordship to grant them leases; but his Lordship happened to come over from England in 1771, took a walk through the town, was pleased with the buildings and improvements, and said "by George, they should all have leases," and ordered them to be filled for three lives renewable for ever, at 6d per foot. His Lordship granted me a lease also for the same term of a thatched cabin, which I had purchased the tenant right of, on my promising to build a good house and slate it, which I did two years after, three stories high. From what I can learn I am induced to believe, that the present Marquis is equal, if not superior to his noble fathor in every respect. As a proof I find that his Lordship has lately granted leases of all the lands at will in his estate (excepting town parks,) and but for the party opposition, and contested Elections that took place, he would grant leases for building in the town also, no doubt. When the late William Higginson, Esq. was agent, I was in that office under him from 1764 to 1780, the late Lord Hertford, was reckoned one of the best Landlords in this Kingdom, and hod Mr. Higginson's judicious, liberal mid disinterested conduct been afterwards followed, by his successor, there would not have been any contested elections, which distracted and so much confused the town, as the whole tenantry looked upon him as a father, and all adored him. His greatest fault was much generosity. In the parish of Magharamisk is Trumry-house, which had been one of the seats of the Spencer family, since the reign of Queen Elizabeth until their lease expired a few years since; it is at present the seat of Philip Stewart, Esq. Mr. Dobbs was uncle to Counsellor Dobbs, member of Parliament for Carrickfergus, and afterwards governor of North Carolina in America, where he died. I may as well say something here upon the present state of Loughneagh, as any where else. being cast by nature into a very ground, all the chief rivers of the five counties Armagh, Derry, Down, Antrim and Tyrone; that is of almost all Ulster, have descending courses from the opposite seas and mountains, till they all meet in this low center, from which they have no way out, but only by one long straight and obstructed passage of the lower Bann, which besides all the increasing obstructions of its own sand and mud, hath two high rocks across its way, one at Portna, the other near Colerain; and a third raised by art for the sake of the Eel-wears, and ought to be removed into a deeper place in the water. I shall mention the names of rivers that flow into it, from the mountains and morasses. The upper Bann, it arises near the Sea out of the mountains of Mourne, and opposite to this not far from the northern Sea, the main water comes out of the large marsh between Loughgeel and Killaggan, and runs through Rasharkin parish, thence to Gilgoram and into the lake below Randles-town near Shanes-Castle. The river Blackwater and a lesser opposite to it, which outer the Lough at Antrim; the Blackwater comes from the Mountains of the Fews in the County of Armagh; from thence to Charlamont and from thence to the Blackwater foot, where it emptys itself into the great lake; the six-mile water comes down by the mountain Slemish, then to Templepatrick and enters into the Lough at Antrim: the opposite rivers enters the lake near Crumlin-bridge, second rises out of the Black-mountain near Belfast, passes through Glenavy and runs into the Lough near Rams-island. The next rivers are three that come southerly, the Coagh, Artree, near Moneymore, and the Moyola that comes by Dawsons-bridge: and opposite to them are three or four that came from behind Castle-Robin near Lisburn, and enter the lake near Portmore and Lurgan. There are other smaller rivers also, about twenty large and small which run into the lake, and but one river to vent or convey all the water of these rivers to the Sea, which is impossible in its present state, unless the rocks at Portna, &c. and the Eel-wares and walls built on the lop of them &c. were removed and the river widened from the Lough to the Sea at Colerain. I am surprised that the noble-men and gentlemen of the five counties whose estates are adjoining to the Lough, do not take this great case into their most serious consideration, and prevent the loss of more good land, and hopes of gaining perhaps many thousand Acres of much better land than they have any where else round about it. Supposing the river were blown up, I cannot imagine it would injure the fisheries, were they sunk three or four feet, wears and other apparatus might then be built and carry on the fisheries as before, but if not the Imperial Parliament could grant money, or even the proprietors of estates round the lake; could purchase the leases from the proprietors of the fisheries, and then sink and widen the river, so as to vent the superfluous water and keep the Lough always down to a proper level. I suppose the Marquis of Hertford for one, would gain one thousand Acres, as his Lordship's fine estate is bounded by the lake for many miles on one side. Extracts from the Records of Old Lisburn - Heterogenea, 1803. Mr. Johnston was born at Portmore Park, in the County of Antrim, in the year 1747. He appears to have resided at various times in the vicinity of Ballynahinch, Glenavy, and Lisburn. From 1764 till 1780 he acted as assistant to William Higginson, Agent to Lord Hertford. In the latter year Mr. Higginson having been removed from the agency, Mr. Johnston became receiver on Lord Moira's Ballynahinch Estate, which position ho continued to occupy after the estate was purchased by David Ker and Matthew Forde. Montalto, Ballynahinch, was up till about 1793 one of the seats of the Earl of Moira, when it passed into the hands of the Ker family. The town of Ballynahinch was founded by the Right Hon. Sir George Rawdon, Bart., ancestor of the Earl of Moira, in the reign of Charles II. "He died at Lisburn in August, 1684, in the 80th year of his age, and was buried there with great magnificence." The Author of Heterogenea was evidently a man of romantic and philosophical tastes, as the volume is full of poetical effusions and philosophical disquisitions. The reader anxious to partake of the poetry and philosophy must be referred to the book itself, as space will not permit of going beyond the subject matter in hand -- the history of the Town of Lisburn and District. 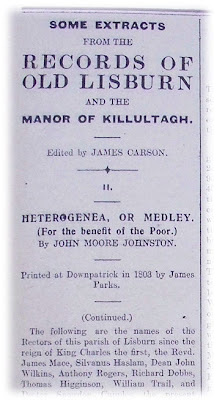 The plea, however, put forward by the Author, in the Introduction, for publishing the book is so quaint, not to say ingenious, that a paragraph is worth quoting -- "I intended to have left in my last will ten pounds to the poor, for each of the Parishes of Lisburn, Ballinderry, and Magharadroll (Ballynahinch), but on second thought judged it more judicious to apply that sum to their benefit in my life-time; and by publishing a Book by subscription in order to raise a larger sum, to purchase houses or lands for ever, would be more eligible and beneficial: the profits to be paid annually to them:-- the Minister, Church Wardens, &c.; Trustees or a Committee to conduct the business. Every one I have spoken to on the subject approves of the plan. It will in some measure preclude the necessity of calling upon the opulent, charitable and well disposed in future should there happen in the course of providence times of scarcity as in 1801; by this means there will be a permanent fund for their support. . . . Arise then ye great ones of the County, and help forward the designs of divine providence: true charity ever dwells with an elevated soul, etc., etc." The response to the appeal was generous, and must have produced a very considerable sum of money. The Marquis of Hertford appears for £20; Matthew Forde, Seaford, £11 7s 6d; David Ker, Montalto, £22 15s 0d; Earl of Moira, £5; the Author, £30 and 500 copies of the Book. There were almost 600 subscribers and contributors applying for over 800 copies, not including those taken by the Author. Still no complains -- "A few persons of rank and fortune declined to subscribe. I shall leave them to their own serious contemplation when they have time to reflect. I fear too many live in dissipation, vicious pleasure, and make a God of this world." The Author of the Heterogenea gives numerous, instances of longevity that came under his notice, dealing quite freely with ages of 100, 104, 108, 111, and 114 years. He writes of an ancestor of his own -- "John Johnston, who married a niece of the Rev. James Mace, Rector of Lisburn, and settled at Ballinderry, near Portmore, in 1670; he died there in 1740 aged 101 years." Also another member of the family -- "William Johnston, who settled at Lisnatrank, near Lisburn, and who was very active in defending that town in 1641 against Sire Phelim O'Neill's adherents; he died in 1700 aged 100 years. His son William Johnston, Doctor of Physic, Warwick, England; about 1711 sold the townland of Lisnatrunk to Mr. Merrifield of Lisburn." The volume,, notwithstanding its obvious imperfections and absurdities, is an interesting contribution to the history of Lisburn and district. It contains some 318 pages, including the introduction and list of subscribers. In addition to the following extracts, the contents embrace a description of Magheradroll Parish, Ballynahinch, Memoirs of the Earl of Moira, Memoirs of the Author, Resolutions of the Parish of Magheradroll, Poems, Letters, Essays, etc. etc. The Book is aptly described by the Author as a Medley. A Description of the upper half Barony of Masseerene, &c. in the county of Antrim, comprising the Territories or Manor's of Kilultagh and Derryvolga. The Territories of Kilultagh and Derryvolga, are bounded on the North by lower Masserene and upper Belfast, in the County of Antrim, on the East and South, by Castlereagh and lower Iveagh, in the County of Down, and on the West by Lough-neagh. These Manors contain about eighty thousand acres english, divided into eleven parishes, viz. Lisburn, Lambeg, Derriaghy, Magheragall, Magheramesk, Aghalee, Aghagallon, Ballanderry, Glenavy, Camlin and Tullyrusk, the whole being the estate of the Marquis of Hertford, who has the presentation to all the parishes except Lambeg, Derryaghy and Magharagall, which are the Bishop's. The Revd. Dr. Snowdon Cupples, is the present rector of Lisburn; the Revd. Phillop Fletcher, Vicar of Magheramesk, Aghalee and Aghagallon; Revd. John Connor, Vicar of Ballanderry; (who resides in England) Revd. Thomas Edward Higginson Curate; (who is a most exemplary and primitive Clergyman) Revd. Saumerez Dubourdieu, Vicar of Glenavy, Camlin and Tullyrusk; the Rev. Philip Johnston, Vicar of Derriaghy; the Revd. Francis Patten, Vicar of Magharagall and Revd. Mr. Wolsely of Lambeg. It is but justice to say, that Lord Hertford and the several incumbents, are very moderate in the article of tithe, which is fettled for their lives on an average not more than 7d. an Acre. Lisburn is the chief town in these districts, and by many esteemed the handsomest inland town in Ireland; is situated seven miles south of Belfast and seventy three north of Dublin, on the river Lagan which divides the Counties of Antrim and Down. Before the reign of Queen Elizabeth, Lisburn (then called Lisnegarvy) was a small village, the proprietor of the territory of Kilultagh, in which this town stands, was one of the O'Neils, a branch of the then Earl of Tyrone's family. In the reign of King James the first the town was much improved, the streets laid out in their present form, and the houses covered with shingles or thatch, Sir Fulk Conway, who obtained a patent of Kilultagh, &c. from King James gave great encouragement to English and Welsh tenants to come over and settle here, which a great number did. (The town of Conway in Wales, was the property of said Sir Fulk Conway.) The following are the names of the tenants who built the town, (the number of houses then were exactly fifty-two,) viz. Henry Culghanson, John Norris, John O'Murrey, Thomas Date, Simon Batterfield, John Slye, John Golly, Hugh Montgomrie, Marmaduke Dobbs, Richard Dobbs, Thomas Paston, John Tippen, Steven Richardson, Christ. Calvert, Ann Morgan, George Rose, Edward Steward, Henrie Wilson, Robert Browne, William Averne, John Dilworth, Kath. Bland, Geo. Davies, John Savage, Jerome Cartwright, Robert Taylor, Symon Richardson, Hump. Dash, William Smith, John M'Nilly, Askulfe Stanton, Henric Hollcote, Francis Bueke, Thomas Symonson, Richard Howle, John Housimen, Patt. Palmer, Robert Warton, William Cubbage, John Ap Richard, Owen Ap Hugh, Antonie Stotthard, John Mace, Humfry Leech, Richard Walker, Henric Freebourne, Edward Gouldsmith, John O'Murrey, Robert Bones, William Edwards, and Peter O'Mullred. The river Lagan is now navigable from Belfast to to Loughneagh, by a new canal lately finished, (by Mr. Richard Owens,) from Lisburn to the Lough, at the expence of the late Marquis of Donegall, which opens a communication to the Counties of Armagh, Tyrone, Derry, &c.
at Lisnegarvey, soon after their rebellion, which broke out the 23rd of October, 1641, is taken from the Church registry of Lisburn: "Sir Phelim O'Neill and Sir Con. Magenis, their Generals then in Ulster, and Major General Plunket, having enlisted and drawn together out of the Counties of Armagh, Tyrone, Antrim and Down, eight or ten thousand men, which were formed into eight regiments, and a troop of horse, and two field-pieces, did rendezvous, on the 27th of Nov. 1641, at a house of Sir George Rawdon, at Brook-hill, throe miles from Lisburn, in which town they knew there was a garrison of five Companies, and Lord Conway's troop of horse. They made their attack in three divisions, at the end of Castle-street, Bow-street and Bridge-street, more than two hundred of the rebels were slain in Bridge-street, and three hundred in Castle-street, and in the meadows behind the houses, whereby they were so much discouraged, that for almost two hours, their Officers could not get any more parties to adventure a second assault upon us; but in the main space they entertained us with continued fire from their body, and their field-pieces, till about one o'clock, that fresh parties were issued out, and beaten back as before, which they supplied with others till dark; when they fired the town, which was in a few hours turned into ashes. The slain of the enemy were found to be more than thrice the number of those who fought against them. Their two generals quit their station; their two field pieces were thrown into the river, or in some mosspit which could never be found; and in their retreat, or rather flight, they fired Brookhill house, and the Lord Conway's library in it, and other goods to the value of five thousand Pounds. All our horse, which did most execution, were not above 120, via -- Lord Conway's troop, and a squadron of Lord Grandison's troop. We got about fifty of their colours and drums. They were so enraged at this defeat that they murdered many hundreds of protestants, whom they had kept prisoners in the counties of Armagh, Tyrone, &c.
this town has entirely consumed by an accidental fire, whence it has taken the name of Lisburn, its ancient name being Lisnagarvey. At present it contains about eight hundred Houses, mostly built of brick, in an handsome manner forming three good Streets, at the junction of which stands a good Market-house, with a Ball room over it, where an assembly is held every fortnight. The Church is large, with a good Spire, a Clock and a set of Bells, (the gift of the present Marquis of Hertford) but no otherwise remarkable, except for having a large and very genteel congregation; the principal inhabitants being of the established religion -- there are likewise a reputable body of Quakers in this town and parish, who have an elegant Meeting-house, and a short distance from it (on Bason-hill) a great boarding school for the education of children of all denominations, established by a large legacy left by the late John Handcock, Esq. of Lisburn, a member of that community. The late Mr. John Gough was head master many years, who was also a preacher amongst the Quakers. The present Mr. John Handcoek son to the above named Gentleman, has lately withdrawn himself from the society of Quakers, which has made a division among them -- he was also a preacher. There are also a large body of Presbyterians and Methodists, who have each an elegant Meeting-house, and some Roman catholics, who have also a good Chapel. The houses are now in general three stories high -- Mr. James Ward, has a good Bookseller and Stationers shop the only one in the town -- Mr. Culson carries on the manufacturing of damask table cloths &c. very extensively -- the trade of this town is very considerable, both in the manufacturing of Linen and Cotton, as also in the Shop-keeping line -- fairs are held on the 21st of July, and 5th of October -- the late Mr. Hunters, William Rogers, Delacherois Crommelin, Roger Johnston Smyths, Samuel Delacherois's Jacob Hancocks, William Darbys and John Sheperds, Esqrs. have elegant houses. -- Samuel Heron Esq. has a good villa in the Castle garden, from which there is a fine view of the river, and part of the County of Down. The Linen-hall erected at the expence of the late Marquis of Hertfort, is a large square court, surrounded by a piazza of brick. There is a very great market for Linen-cloth, &c. held here weekly on Tuesday. The present Marquis of Hertford in 1796, built a very good Shambles, on a small rivulet at Smith-field, where a great number of black Cattle are exposed to sale every Tuesday. The principal inns are kept by Mr. Samuel Waring and Mr. Shaw. There was a noble Castle here formerly built by the Earl of Conway, (who died in 1690) which was burned down in 1707, but never rebuilt. Vitriol is made here at present by Doctor Alexander Crawford, a Physician of eminence and respectability; the works were first erected about thirty years ago, by Messrs. Thomas Greg and Weddell Cunningham of Belfast. The town is supplied with water by pipes from a bason above it, where it is conveyed fountains in Castle-robin, and Mountains about three miles from the town. The Streets are wide and well paved, and lighted with globe Lamps at proper distances. Lisburn now returns one member to the imperial Parliament, since the union. I must remark here that I look upon the late union to be one of the most important, and salutary measures for the peace and permanent happiness of this Kingdom at large, that ever was accomplished. It has struck off all small or rotten Boroughs as they were called, which is a complete Parliamentary reform, what we have all being crying, barking, yelping or squalling for these many year's past. It has in a great measure put down party also, as a proof of this, witness the late general Election, how few contests there were, a circumstance at which all good men should rejoice; for how was this and other towns formerly torn and distracted by contested Elections, what drunkenness, perjury, idleness, and deaths did they, not cause! Well that’s just what happened to me the other day. I was in a building where they were just about to start some major renovations. The various offices where packing up their bits and pieces and sorting through what was to go to the temporary office, what could be put in storage and what could be disposed of. So now I am the possessor of over 100 newspapers dated between 1840 to 1940 including some souvenir editions... and one page from the Ulster Echo (Belfast, 1874-1916) of which there are no copies available even on microfilm. It would appear they once belonged to an amateur historian given some of the marked content and that among the papers were also several large brown envelopes which contained cuttings detailing various historical events. While most of these cuttings were of no particular interest in regard to my site I was able to pass them on to an interested party. One of the envelopes though contained a series of cuttings taken from the Lisburn Standard. 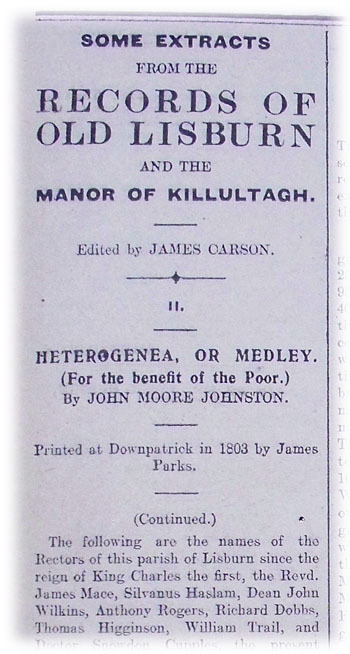 They were a series of articles called “Some Extracts from the Records of Old Lisburn and the Manor of Killultagh.” Edited by James Carson, they began on 20 October 1916 and were published in the paper each Friday (almost) for over a year. While I will be adding these to my News Extracts site along with the other information in each cutting I intend to publish the “Records of Old Lisburn” here on my blog on the anniversary of the date of their original publication.